Sorry for my silence lately readers- I've been under a lot of pressure and sadly Skin Deep has had to take something of a back seat in my attempts to prioritise. Aside from an apology, this also brings me to today's post rather fittingly. I've always been lucky with my skin and have never really suffered from severe breakouts. However, my skin definitely mirrors what's going on in my life; I get one or two hormonal spots on my chin when it's that time of month and quite a few tiny pimples on my forehead when I'm stressed. This isn't helped by the fact that, like many women, eating well and getting sufficient sleep fall near the bottom of my "to do" list in times of pressure and I've noticed that this can make my sensitive skin more reactive. I like Dermalogica and always find that the products perform well. As a mid range brand with more of a focus upon science than nature, I wouldn't necessarily veer towards Dermalogica over other brands but it is one that I come back to every now and then and remember that it's actually a very good quality line. 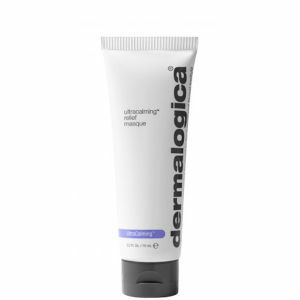 Ultracalming Relief Masque is part of the sensitive skincare range from Dermalogica. Having tried the Ultracalming Cleanser and been impressed in the past, I had high expectations of this mask and I'm delighted that it didn't disappoint. It's a delicately scented, gel cream formula which is easy and mess-free to use. Simply apply a generous layer to dry, clean skin, wait 10 minutes then rinse off with warm water. I really liked how easy it is to rinse off and although 10 minutes is a little longer than I'd like (I'm more of a 5 minute mask kind of girl), I found it a good way of forcing myself to unwind. Although I didn't notice a dramatic difference to my skin, it was left feeling calmed and conditioned and I'd say that the product delivers on its promises. I'd definitely keep a tube of this in my bathroom for times when my skin needs some extra support, be it through stress, late nights or simply the change in seasons. My only complaint is that I do feel this is quite an expensive mask at £37.60 for 75ml and although it feels high quality, I'm not sure I'd commit to using it regularly enough to justify the price. I would love to find something that dealt with those hormonal breakouts for good! My skin sounds like it reacts the same as your under stress etc….. but I love a 20 min face mask, I always feel a bit disappointed when I buy something and it says to do anything less! Thanks for your comment. I'd def recommend checking out Limited Edition Cleanser from Heaven Skincare by Deborah Mitchell.